Manischewitz is the nation’s largest manufacturer of processed kosher food products. We’re also the number one baker of matzo or unleavened bread in the entire world. We produce hundreds of other kosher foods too, including baked goods, pastas, soups, gefilte fish, grape juice and borscht. Under the Manischewitz, Horowitz Margareten, Goodman's and Season names, we sell our products to specialty food distributors in the United States, Canada and throughout the world––although from the homemade quality of our products, you’d think they came right from your Bubbe’s kitchen. Manischewitz® is committed to giving back to Jewish communities around the country. The betterment of those around us is of paramount importance as we strive to encourage growth and charity in and around these grassroots organizations. We encourage you to help as well. Yehuda Matzos Whole Wheat Kosher For Passover 10.5 oz. Pack of 3. 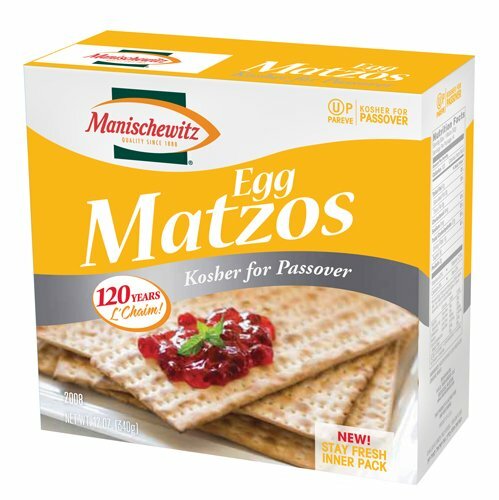 Streit's Passover Matzos Kosher For Passover 16 oz. Pack of 6.